Latino parents in the DeKalb and Sycamore school districts have just completed the spring session of “Universidad para Padres” (Parent University), a community outreach program that empowers mothers, fathers and grandparents to take active roles in their own personal growth and their children’s academic success. The program, which ran from October through May, consisted of 22 sessions at DeKalb High School and a concluding ceremony led by NIU President Doug Baker. Meetings featured local experts who covered everything from bilingual options in K-12 education to health promotion, household finances, parenting styles and the college application process. One of the program’s goals is to prepare Latino parents to overcome cultural, financial and language barriers so they can effectively support their children’s education. Another aim is to help parents identify and pursue their own educational and career goals. “Parents who are successfully pursuing their own growth have a better chance of helping their children do the same,” says Parent University Coordinator Susana Das Neves. A doctoral candidate in the College of Education, Das Neves hopes to write her dissertation about the efficacy of this parent university model. “Parent University is about empowering the whole family, making sure everyone is getting the skills they need, and connecting parents and kids to relevant local resources,” says Das Neves. The program also offers childcare facilitated by NIU student volunteers while parents are in class. Parent University is supported by the Northern Illinois Regional P-20 Network, a collaborative organization based at NIU which includes 13 community colleges and 30 school districts. It is part of the P-20 Network’s efforts to build communities that support college and career readiness. Parent University partners include NIU, Kishwaukee College, and school districts in DeKalb, Sycamore and Rochelle. 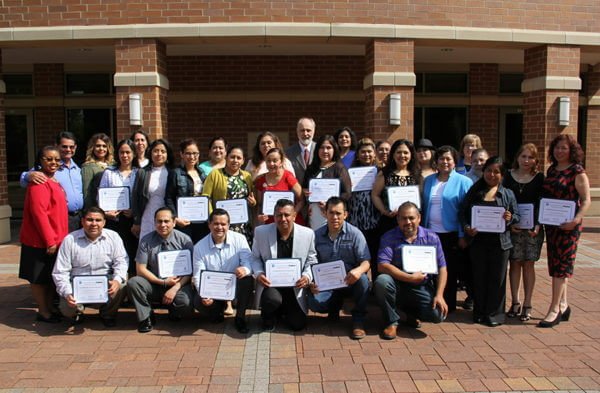 This year, Parent University also partnered with local organizations to organize special sessions, such as a healthy cooking class offered by Northwestern Medicine-Kishwaukee Hospital and an NIU campus visit sponsored by the Latino Resource Center and Center for Latino and Latin American Studies. LULAC (League of United Latin American Citizens) of Rochelle, Parent University and DREAM Action NIU collaborated to organize a “Know Your Rights” workshop about immigration legislation. “We are grateful for both programmatic and financial support from the community. Special thanks goes to our sponsors at Cabrera Capital Markets, First Midwest Bank, Hy-Vee, Soft Water City, Inc. and Taxco Restaurant,” said Das Neves. As part of the leadership development component, parents who participated in Parent University presented at two statewide conferences: the Annual Statewide Every Student Succeeds Act (ESSA) Conference and the Twelfth Annual Statewide Summit for Bilingual Parents. Parent University is scheduled to return in the 2017-18 school year on Thursday evenings, 6-8 p.m., at DeKalb High School. For more information or to refer parents in the DeKalb or Sycamore school districts, contact Susana Das Neves at 815-753-1420 or parentuniversity@niu.edu.